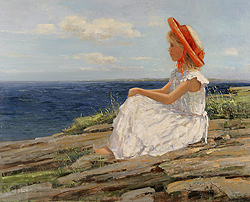 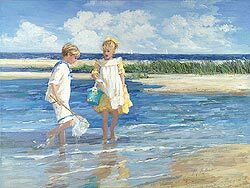 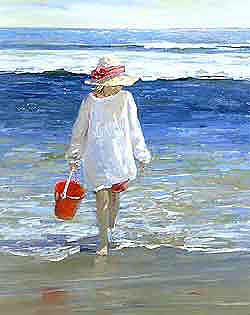 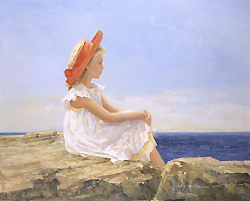 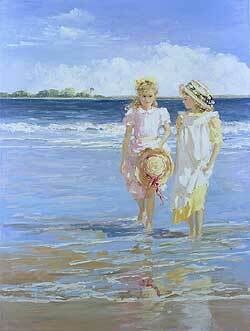 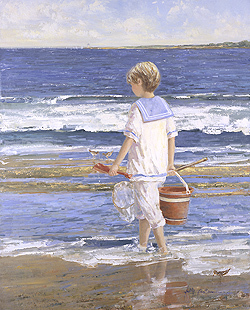 Sally Swatland was born in 1946 in Washington, DC and moved to Greenwich, Connecticut when she was seven. 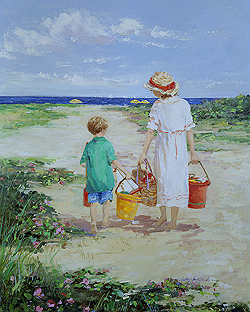 Her father was a successful attorney, which allowed her family to spend long periods in the countryside with many vacations at various seaside locations throughout the United States. 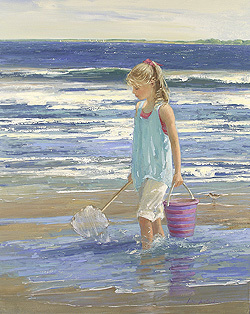 She shared a passion with her family for beaches, sunshine, and fresh air. 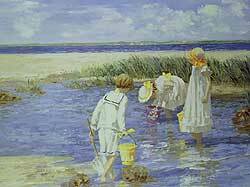 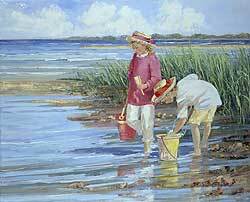 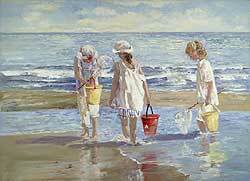 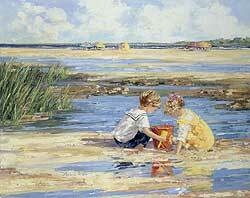 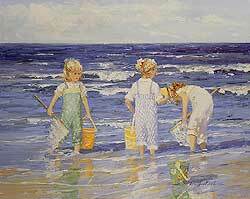 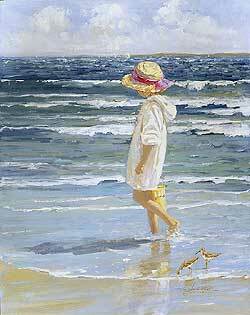 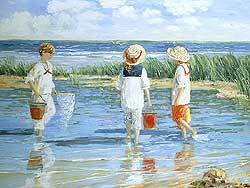 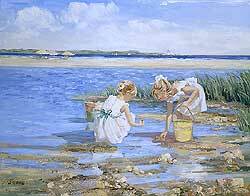 Most summer days were spent at the beach playing in tidal pools, chasing minnows, collecting shells and exploring. 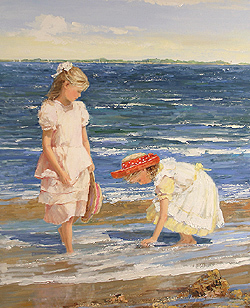 Sally has two sisters who were also encouraged to study drawing, painting, and anything that developed creative expression. 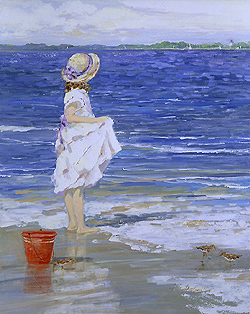 Throughout her childhood and teens she painted and drew constantly, developing skill at observing and recording the world around her. 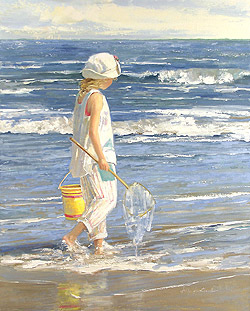 She started painting when she was five. 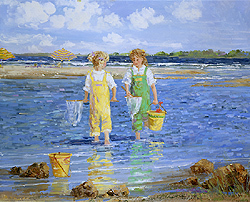 Throughout grammar school, high school and college she was always enrolled in art classes. 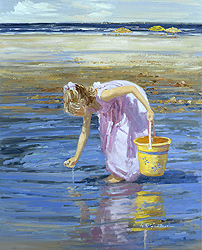 She has always had a passion for art and loves experimenting with color and light. 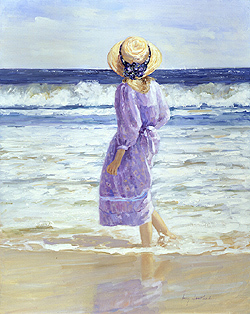 After graduating with a degree in Fine Art from Mount Saint Vincent College, she went on to study formal figure drawing for six years (1969-1974) at the Art Students League of New York. 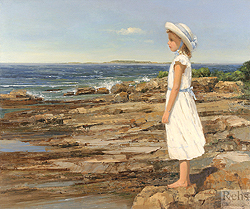 There she studied under Robert Shultz (the illustrator who continued Norman Rockwell's tradition and became famous for his illustrations that graced the covers of many Zane Gray books). 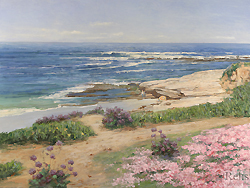 During the summer months Schultz held numerous plein-air classes on landscape painting in the New Jersey countryside where Sally would religiously drive long distances to attend. 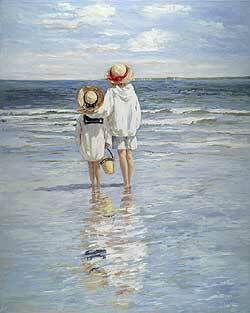 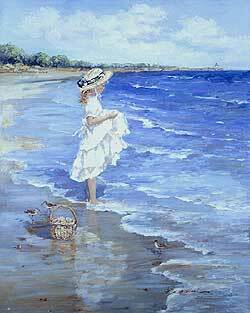 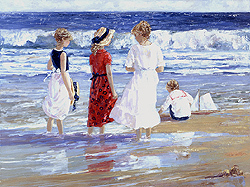 Sally married in her mid-twenties and painted her first 'beach scene' while she was pregnant with her first child. 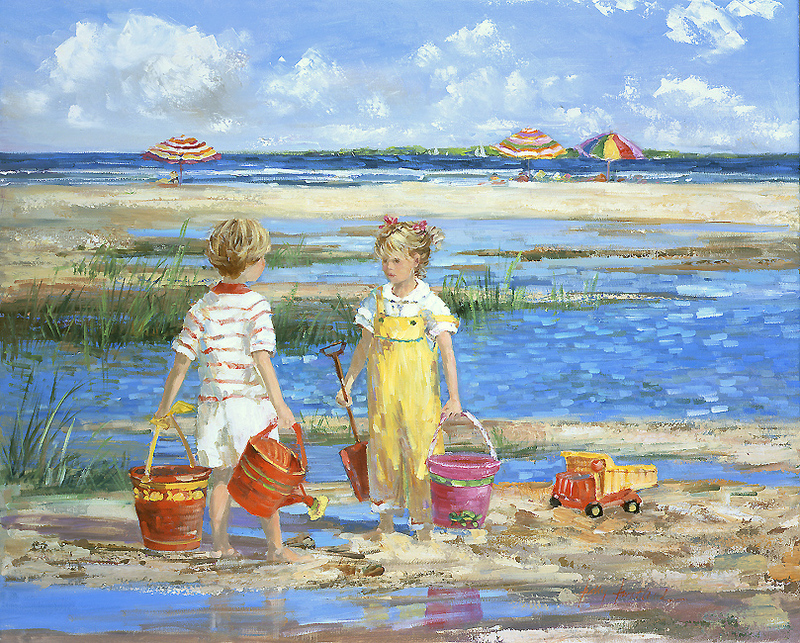 Sally remembers the time quite well: It was somewhat of an accident that I thought about painting children at the beach. 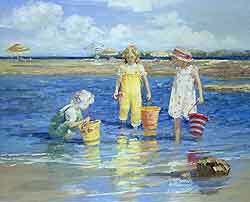 I had studied figure and landscape painting at the Art Students League and I was somewhat searching for a subject that interested me. 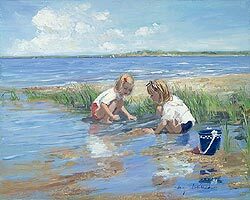 While I was pregnant with my first child, one day I went to the beach with my mother and took some photos of children playing in puddles. 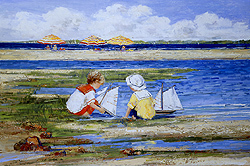 I went home and painted a small painting and showed it to some people. 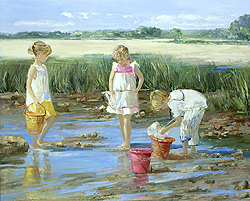 The response was very encouraging. 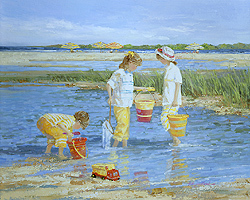 They liked the feeling of the painting. 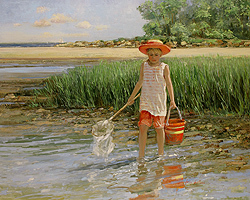 I painted a few more that summer. 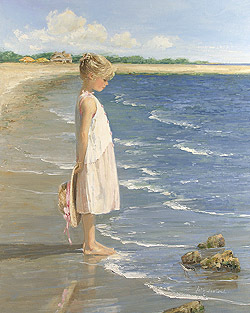 After the birth of her first daughter, Noelle in 1975, she spent many summer days at the beaches around Greenwich, Connecticut. 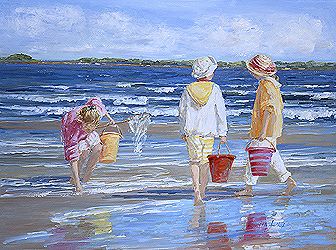 She would take Noelle and her friends to the beach during the summer months. 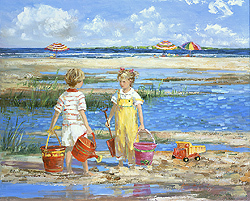 There she would capture children on film in all types of beach activities. 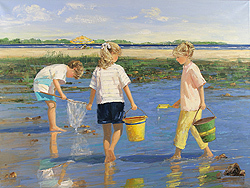 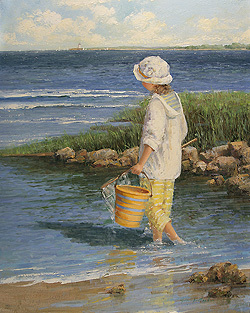 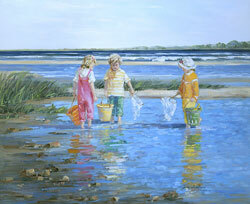 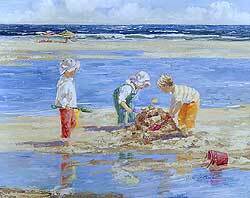 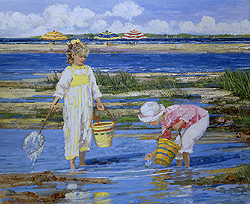 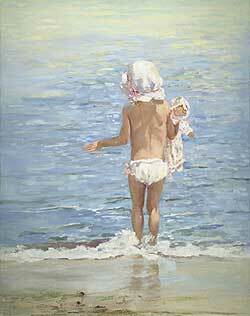 Her favorite images are of children playing in tidal pools, yielding light filled and colorful reflections. 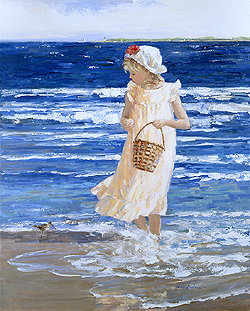 When her second daughter, Katie, was born in 1981 she continued the daily summer visits to the beach - adding a new model for her work. 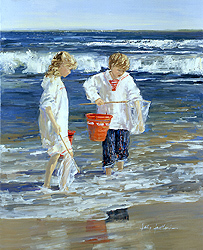 The groups of children who gathered to go to the beach grew in numbers and as Noelle and Katie got older, the family would travel to beaches in the Hamptons, and to various beaches in Northern and Southern California. 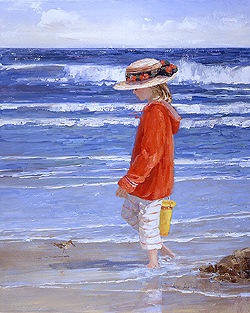 Sally would carry a variety of colorful clothing and an assortment of hats to the beach and she spent a considerable amount of time searching for the right beach apparel. 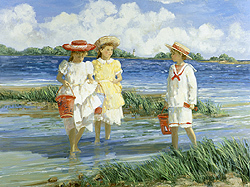 There was a significant amount of bribery that went on between Sally and her children so that they would co-operate in what she now calls her 'beach dress up photo archives'. 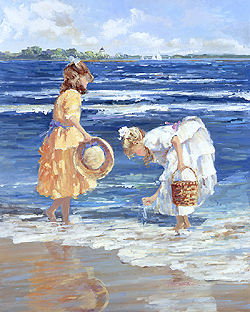 The children knew it was a way to acquire further summer treats and gain extra benefits; the children knew how to gain favors - it was all quite amusing to Sally. 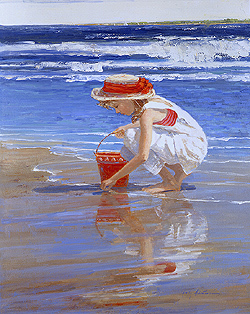 Her beach photo sessions would always draw a crowd, especially the young children, which allowed her access to even more models. 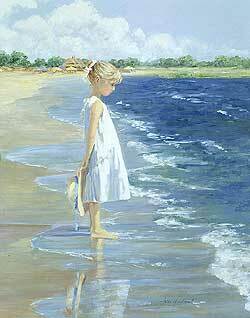 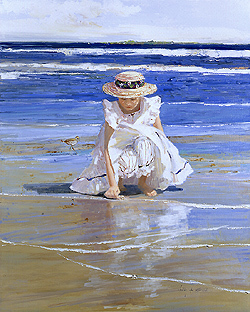 During the winter months Sally would spend her time painting portraits with most of her commissions coming from referrals, however her love was the summer images on the beach. 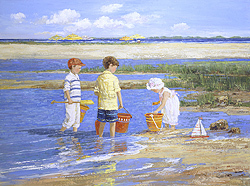 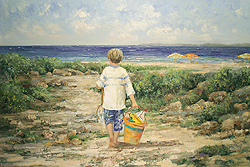 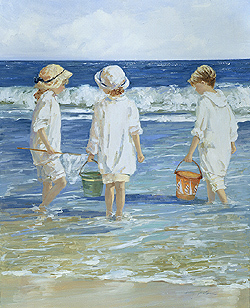 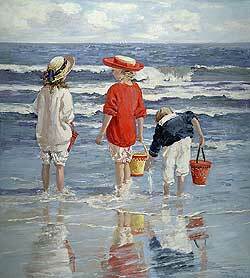 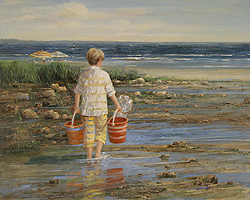 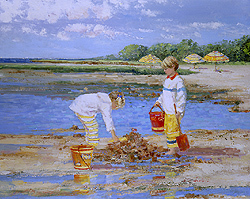 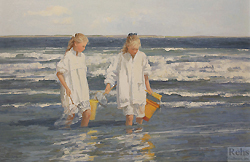 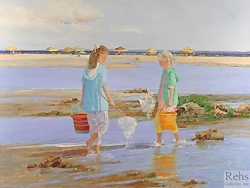 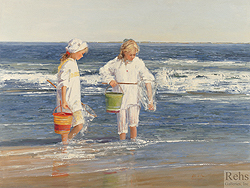 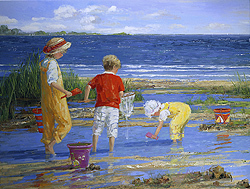 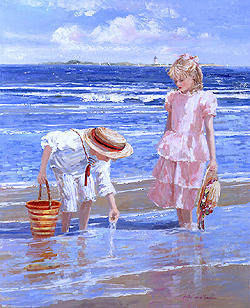 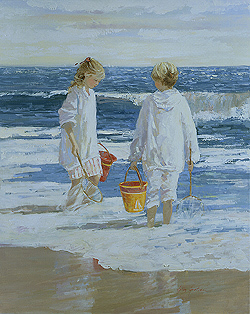 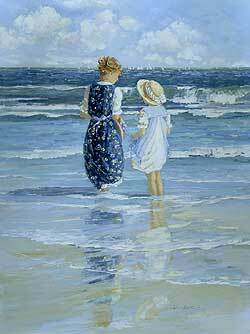 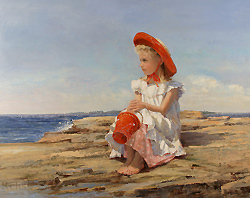 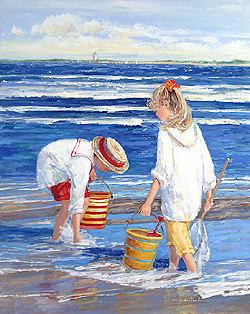 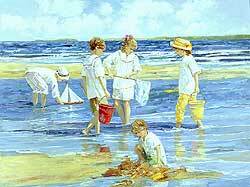 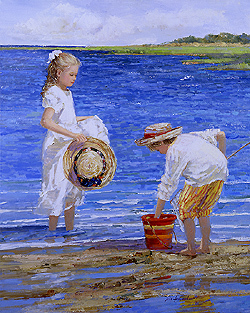 Today, while she still receives many commissions for portrait work, she has turned her attention to her carefree images of children playing on the beach. 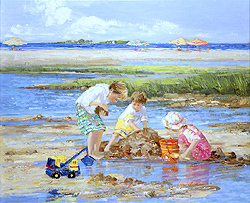 Sally uses her extensive 'beach dress up photo archives' as inspiration for her warm and colorful images of childhood. 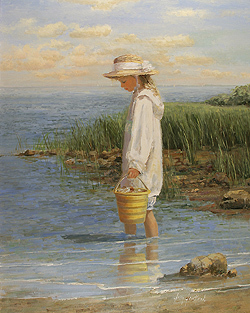 Sally has exhibited in the Hudson Valley Juried Show; was selected to paint the Governor of Connecticut's Christmas card two years in a row; has had a number of one-women shows in Connecticut and is involved in numerous charities. 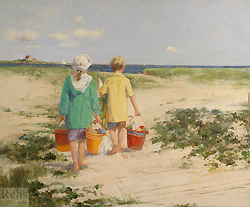 Each year Sally donates works to: Brunswick Academy, Greenwich Academy, Lime Association of Fairfield County, Putnam Indian Field School and Sloan Kettering Hospital (American Cancer Society) so they may be auctioned off to raise funds. 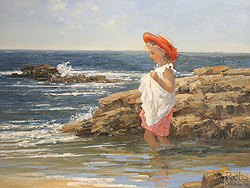 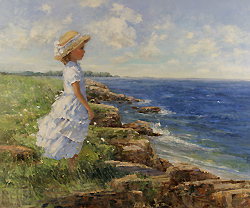 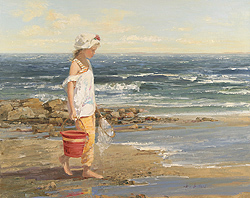 Currently Sally is a member of the following Societies: American Impressionist Society; American Society of Marine Artists; American Society of Portrait Artists and the Cape Cod Art Association. 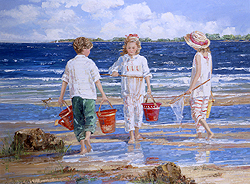 This essay is copyrighted by Rehs Galleries, Inc. and may not be reproduced or transmitted without written permission from Rehs Galleries, Inc.